I have the sample population of a certain signal's registered amplitude maxima. Population is about 15 million samples. 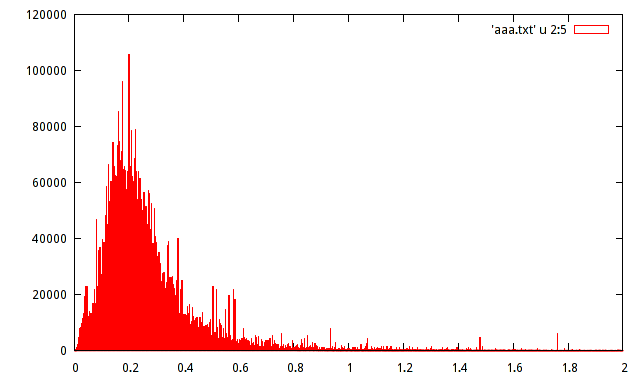 I produced a histogram of the population, but cannot guess the distribution with such a histogram. Here's the CRAN link to fitdistrplus. Here's the old vignette link for fitdistrplus. If the vignette link doesn't work, do a search for "Use of the library fitdistrplus to specify a distribution from data". The vignette does a good job of explaining how to use the package. You can look at how various distributions fit in a short period of time. 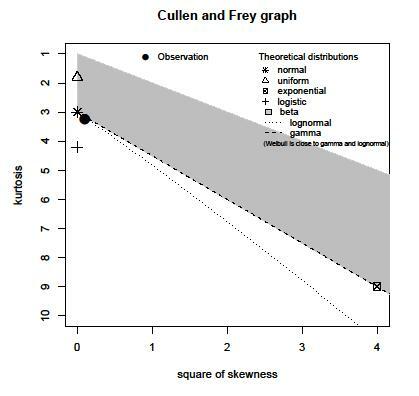 It also produces a Cullen/Frey Diagram. Population is about 15 million samples. Then you will very likely be able to reject any particular distribution of a simple, closed form. Even that tiny bump at the left of the graph is likely to be enough to cause us to say 'clearly not such and such'. On the other hand, it's probably pretty well approximated by a number of common distributions; obvious candidates are things like lognormal and gamma, but there are a host of others. It you look at the log of the x-variable, you can probably decide whether the lognormal is okay on sight (after taking logs, the histogram should look symmetric). If the log is left skew, consider whether Gamma is okay, if it's right skew, consider whether inverse Gamma or (even more skew) inverse Gaussian is okay. But this exercise is more one of finding a distribution that's close enough to live with; none of these suggestions actually have all the features that appear to be present there. If you have any theory at all to support a choice, toss out all this discussion and use that. I am not sure why you would want to classify a sample to a specific distribution with such a large sample size; parsimony, comparing it to another sample, looking for physical interpretation of the paramters? Most statistical packages(R, SAS, Minitab) allow one to plot data on a graph that yields a straight line if the data come from a particular distribution. I have seen graphs that yield a straight line if the data is normal(log normal-after a log transformation), Weibull, and chi-squared come to mine immediately. This technique will allow you to see outliers and give you the possiblity to assign reasons for why data points are outliers. 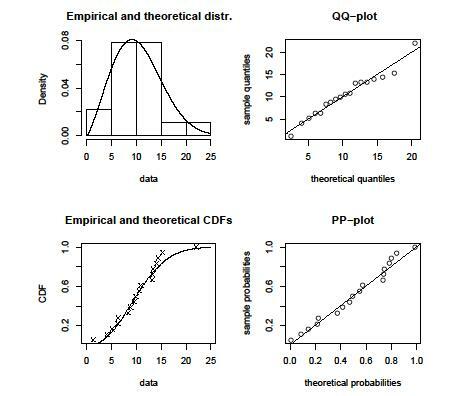 In R, the normal probability plot is called qqnorm. Not the answer you're looking for? Browse other questions tagged distributions histogram or ask your own question. Is this a reasonable approach to fitting distributions? What distribution would lead to this highly peaked and skewed density plot? Do skewness and kurtosis uniquely determine type of distribution? Is there a general/golden rule for appropriate binning in a histogram? What type of distribution to use?